Matthew 5:43-45: You have heard that it was said, "Love your neighbor and hate your enemy." 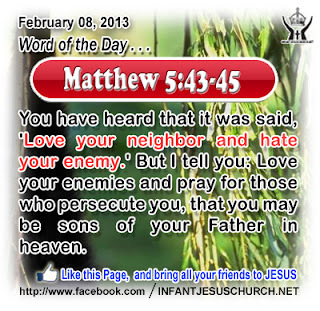 But I tell you: Love your enemies and pray for those who persecute you, that you may be sons of your Father in heaven. Heavenly Father, thank you for loving us when we were still an enemy to you. Thank you for risking the death of your Son to offer us the chance to accept or reject your love. As you have promised, please pour your love into our heart so we may love even our enemies as you have loved us. In the name of your ultimate Gift of love, Infant Jesus, we pray. Amen. 14King Herod heard of it; for Jesus' name had become known. Some said, "John the baptizer has been raised from the dead; that is why these powers are at work in him." 15But others said, "It is Eli'jah." And others said, "It is a prophet, like one of the prophets of old." 16But when Herod heard of it he said, "John, whom I beheaded, has been raised." 17For Herod had sent and seized John, and bound him in prison for the sake of Hero'di-as, his brother Philip's wife; because he had married her. 18For John said to Herod, "It is not lawful for you to have your brother's wife." 19And Hero'di-as had a grudge against him, and wanted to kill him. But she could not, 20for Herod feared John, knowing that he was a righteous and holy man, and kept him safe. When he heard him, he was much perplexed; and yet he heard him gladly. 21But an opportunity came when Herod on his birthday gave a banquet for his courtiers and officers and the leading men of Galilee. 22For when Hero'di-as' daughter came in and danced, she pleased Herod and his guests; and the king said to the girl, "Ask me for whatever you wish, and I will grant it." 23And he vowed to her, "Whatever you ask me, I will give you, even half of my kingdom." 24And she went out, and said to her mother, "What shall I ask?" And she said, "The head of John the baptizer." 25And she came in immediately with haste to the king, and asked, saying, "I want you to give me at once the head of John the Baptist on a platter." 26And the king was exceedingly sorry; but because of his oaths and his guests he did not want to break his word to her. 27And immediately the king sent a soldier of the guard and gave orders to bring his head. He went and beheaded him in the prison, 28and brought his head on a platter, and gave it to the girl; and the girl gave it to her mother. 29When his disciples heard of it, they came and took his body, and laid it in a tomb. God's grace enables us to fight fear with faith and to conquer the temptation to compromise goodness and truth with wrongdoing and falsehood. The Lord gives grace to the humble, to those who admit their sins and who seek God's mercy and pardon. His grace and pardon not only frees each one of us from a guilty conscience, it allows us to pursue holiness in thought and action as well. Do we rely on God's grace and help to choose his way of holiness and to reject whatever would compromise your faith and faithfulness to Christ? Heavenly Father, form in us the likeness of your Son that we may reproduce him in word and deed. Help us to live the gospel faithfully and give us the strength and courage we need to not shrink back in the face of hardship and temptation.